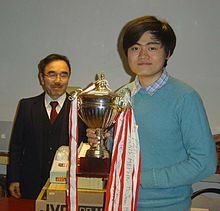 Fan Hui (Chinese: 樊麾; pinyin: Fán Huī; born 27 December 1981) is a Chinese-born French Go player. Becoming a professional Go player in 1996, Fan moved to France in 2000 and became the coach of the French national Go team in 2005. He was the champion of the European Go Championship in 2013, 2014 and 2015. As of 2015, he is ranked as a 2 dan professional. He additionally won the 2016 European Professional Go Championship. In October 2015, Fan was defeated by the Google DeepMind AI program AlphaGo 5–0, the first time an AI has beaten a human professional player at the game without a handicap. Fan described the program as "very strong and stable, it seems like a wall. ... I know AlphaGo is a computer, but if no one told me, maybe I would think the player was a little strange, but a very strong player, a real person." After his defeat, Fan Hui was hired to advise the AlphaGo team and provided a "sanity check" on Go theory. He served as a judge for the AlphaGo versus Lee Sedol match and observed it in person. He later helped compile commentaries on the matches on AlphaGo's website. Fan is one of the authors of DeepMind's paper on AlphaGo Zero published in the journal Nature on 19 October 2017. ^ "谷歌围棋人工智能击败职业棋手 樊麾：不犯错的对手太可怕" (in Chinese). Guancha.cn. 28 January 2016. Retrieved 20 October 2017. ^ "围棋人工智能面临最后瓶颈 PK李世石看好谁？" [Who was the Go AI's final challenger?]. Sina (in Chinese). 28 January 2016. Retrieved 29 January 2016. ^ "围棋不只是中日韩争霸,"荒漠地带"蕴藏火苗" (in Chinese). Nanjing Chenbao. 28 March 2014. Archived from the original on 31 January 2016. Retrieved 28 January 2016. ^ "第26届法国围棋大会交流与文化探索夏令营规程" (in Chinese). Sina.com. 18 January 2015. Retrieved 28 January 2016. ^ 1st European Professional Go Championship. Accessed February 18, 2016. ^ "Google achieves AI 'breakthrough' by beating Go champion - BBC News". BBC. 27 January 2016. Retrieved 28 January 2016. ^ Silver, David; Schrittwieser, Julian; Simonyan, Karen; Antonoglou, Ioannis; Huang, Aja; Guez, Arthur; Hubert, Thomas; Baker, Lucas; Lai, Matthew; Bolton, Adrian; Chen, Yutian; Lillicrap, Timothy; Fan, Hui; Sifre, Laurent; Driessche, George van den; Graepel, Thore; Hassabis, Demis (19 October 2017). "Mastering the game of Go without human knowledge". Nature. 550 (7676): 354–359. doi:10.1038/nature24270. ISSN 0028-0836. Retrieved 11 December 2017. This biographical article relating to a Go figure is a stub. You can help Wikipedia by expanding it.